The Holy See has announced that Blessed Joseph Vaz of the Oratory is to be raised to the altars as a saint during the Holy Father's visit to Sri Lanka this coming January. Joseph Vaz was a priest of the Congregation of the Oratory in Goa, before going to Ceylon (now Sri Lanka) as a missionary. "Pope Francis’ approval of the votes of the Ordinary Session of the Cardinals and Bishops in favour of canonisation of Blessed Joseph Vaz attains special significance in the wake of the forthcoming visit of the Holy Father to Sri. Lanka in January 2015. Bl. Vaz was born in Goa, India, in 1651. As a priest he volunteered to work in Sri Lanka amid persecution of Catholics by Dutch colonial rulers, who were Calvinists. Catholic priests were forbidden to preach; it would mean imprisonment and even death if they were caught. Bl. Joseph Vaz went to Ceylon disguised as a labourer. He walked the rural paths through the tea-gardens, searching for Catholics, ministering to their needs, instructing them in the faith, regularizing their marriages, baptizing their children, and celebrating Holy Mass in their homes and villages. He was a veritable apostle for the Sri Lankan Church and he renewed the faith which had been affected by persecution. He also instrumental in converting a number of people to Christianity. It was in 1693 that the Bl. Joseph Vaz worked a miracle of rain during a drought and the King of Kandy offered him protection and freedom to preach the Gospel in the Kingdom of Kandy. He used the missionary method of inculturation and composed a para-liturgy in Tamil and Singhala. He educated his servant John to be a priest. John belonged to the Kumbi tribe which at that time was not accepted for priesthood. During a small epidemic in Kandy, the king and other nobles fled but Bl. Joseph Vaz remained ministering to the dying and abandoned victims for almost 2 years. Bl. Joseph Vaz finally died in 1711 after 23 years of arduous missionary work in Sri Lanka. There does seem to be a special role for Bl. Joseph Vaz to play at this moment of history. His life and ministry becomes very relevant especially now when we experience persecution against Christians in several countries specially in Asia. Bl. Joseph Vaz has the distinction of founding a missionary Oratory - priests who would be available for frontier missionary work. 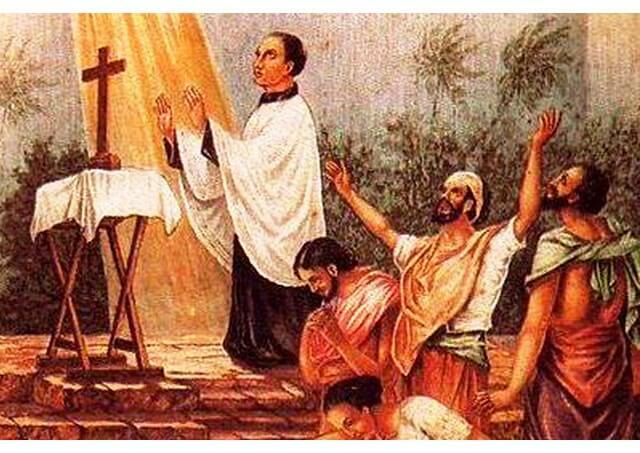 Since Blessed Joseph Vaz was born, educated and ordained a priest in India and opted to be a missionary in Sri Lanka, both the countries have special significance at his being raised to the honours of the altar. May he intercede for all those suffering from persecution specially in Asia."